Frose' - Rose and Strawberry Slushies! A lovely drink that's not too sweet with only 2 ingredients! Rose and Strawberries! 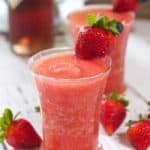 Add frozen strawberries, rose and ice to a large powerful blender and blend until smooth. Taste. Add liquor if desired and sugar if needed.